The Everfree can be deadly to even those who choose to live there! So be mindful and beware! 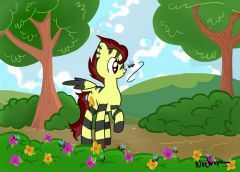 While helping Fluttershy gather supplies, Zecora comes down with a terrible disease called Swamp Fever; even though a cure has not been discovered, Fluttershy makes it her mission to heal Zecora no matter what it takes. The episode aired Saturday 11:30 AM EST on September 23rd!! This thread is dedicated to discussing the episode before, during, and afterwards. As the thread is now open it may indeed contain spoilers. I ask that potential spoilers talked about or shown before the episode airs stay within the spoiler tags please, after the episode you no longer have to use the spoiler tags, but warning, if you haven't seen the episode yet after it airs, this thread no doubt will have all sorts of spoilers in reviews, images, etc. So tread at your own risk!